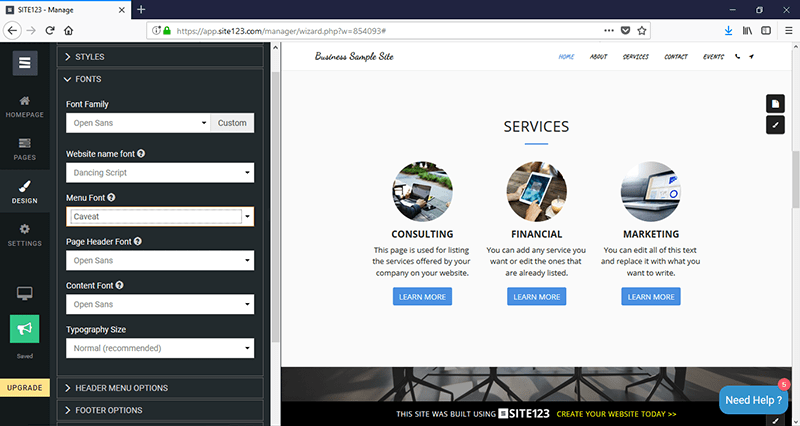 Site123 has made its name in the website builder market by focusing on one goal: empower businesses and professionals to get a good-looking, fully-functional website up quickly and efficiently. The keyword here is efficiency: instead of going with the traditional drag-and-drop design route (which sometimes overwhelms its users with the sheer number of options available), Site123 has opted for an editing sidebar that streamlines the customization process and cuts your site building time down to minutes. If you’re not looking to spend much time learning the builder and tweaking your site, then Site123 is the best option for you. Site123 has made its name in the website builder market by focusing on one goal: to empower businesses and professionals to get a good-looking, fully-functional website up quickly and efficiently. The keyword here is efficiency: instead of going with the traditional drag-and-drop design route (which sometimes overwhelms its users with the sheer number of options available), Site123 has opted for an editing sidebar that streamlines the customization process and cuts your initial site building time down to minutes. Sure, you can get a lot more flexibility with Wix, or a more sophisticated look with Squarespace, but if you’re going for just pure efficiency, then Site123 is the best option for you. As an added bonus: instead of having to figure out everything by yourself, Site123 has provided a veritable gold mine of well-written support articles that have been illustrated with videos, pictures, and screenshots. I did find it very disappointing that SITE123 does not have links to live sites running on their platform. Before committing time or money to a product, I like to see how other customers are utilizing its features. Not only does it demonstrate the product’s abilities in real-world situations, it lets me evaluate its suitability for my project, sometimes even sparking new ideas. While you can certainly take all the time you like developing a free site with SITE123, it is more challenging, and certainly more time consuming, than browsing a completed, fully functioning site. While SITE123’s templates are not especially exciting, they have great flexibility in layout, fonts and color palette. There is a choice of several page types which are standard on most websites today. These pages have all the necessary coding built in, so all you need to do is personalize it with your information. You can choose to have your site display all the pages on the homepage or as a traditional multipage site displaying every page separately. When choosing a multipage site, there is the option of having any standalone page(s) appear on the homepage as well. Deciding which pages appear on the menu is also up to you. You can easily change the order of the pages by dragging and dropping. A big plus is that all the layouts are completely responsive and will adjust to display optimally on whatever size screen is being used (computer, tablet, or phone). There are several important design choices that will affect the look of your site globally. These include the layout of the site, such as the placement of the logo and menu items, as well as selecting fonts for different sections of the site, such as menu, titles, and body texts. You can also choose what appears in the header, footer and add links to your social media pages. Within the styles option, there are several color palettes that globally control the colors of elements of the site – including background, font, and line colors. In the free version, you can only choose one of these preselected color combinations. A premium version will allow you to create any custom combination of colors for your site. Remember, that you can select or change these settings at any time, so if you want to wait with those decisions and get right to the meat of your site – go right ahead! Unfortunately, even if you do know how to code HTML and CSS, you will not be able to use these skills to enhance the design, as there is no access to the source code. Search Engine Optimization and Analytics: In the free site you can add meta tags to the home page and integrate Google Analytics. Upgraded plans will give you access to other marketing and analytics tools such as Google AdWords, Twitter Conversion Tracking and well as other popular webmaster tools. Live Chat: Premium plans will allow the integration of any of several popular live chat options. E-commerce: While the free plan supports e-commerce, premium plans add varying levels of upgraded services to enhance the e-commerce experience for you and your customers. While the features are clearly listed under each plan, I was hoping to view a sample SITE123 e-commerce site to better understand them. Unfortunately, there are no live sites to view, but SITE123 assured me that they work very closely with their customers to fulfill all their e-commerce requirements. Images: If you do not have the budget for custom photography, SITE123 has an extensive library of free stock photography and icons available to enhance your site. Multiple Languages: With SITE123 Multilingual Website Tool you can create multi-language websites in a just a few clicks. Other available features include a blogging platform, form building, email marketing integration and social sharing images. There are also some industry-specific tools available, such as creating a restaurant menu and media tools for musicians. The site builder tools are easy to navigate and simple to understand. You can select the fonts, colors, and layout within the design and settings sections. Pages update in real time so you can preview pages with changes or updates before publishing them. Thematic templates can be created and edited without any coding skills. On the “Team” page, you will enter a name, position, biography, photo, contact and social information for each member of the team. When completed, the SITE123 constructor will transfer information to a professionally created page. 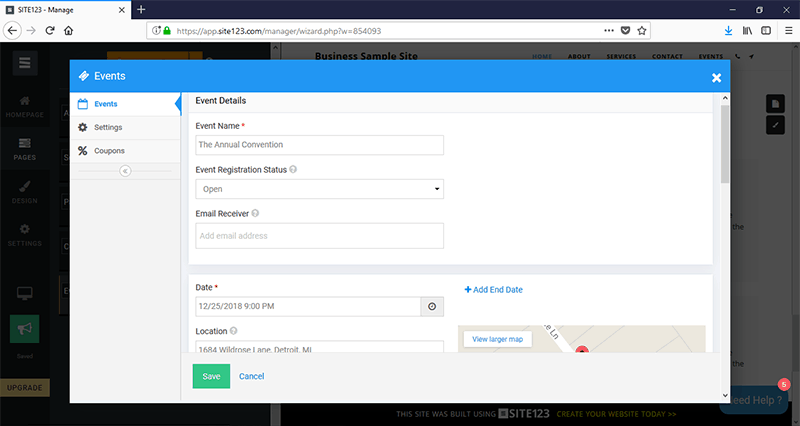 The Events page allows you to enter information such as the date, time and place for multiple events, and then display all of this information on one page. 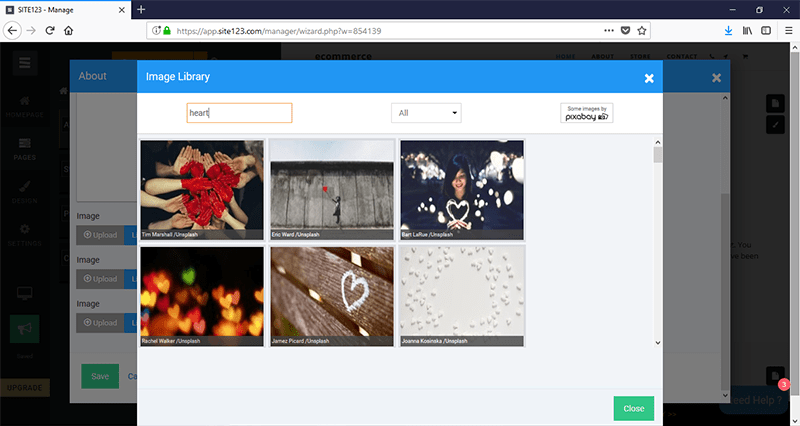 The Gallery page will prompt you to upload photos and videos with titles and captions, and then you will be able to get a fully functional thumbnail gallery. Each page type has its own set of layout options, so you can choose the one you like best. The Contact Us page will contain contact information, a contact form, and a Google map showing your location. It’s important to note that with the free version, the results of this form will not be sent to you by email; In order to receive any messages, you will have to log in to your SITE123 dashboard. The e-commerce section is easy to set up. You can organize products by category and automate the calculation of sales tax and shipping costs. If you want to receive payments, you need a premium tariff plan that provides an option with payment processing services such as PayPal and Stripe. I know, almost a perfect 5! There are tutorials and help files for every feature and aspect of building your site and they are broken down into categories so you can easily find the answers you need. Additionally, their live chat help is available 24/7 and responds to questions immediately. Their representatives are knowledgeable, helpful, and patient. Even if a question is covered in their tutorials, they will walk you through the process, including sending you screenshots, until you have your answer. For example – while working with their back end, I created a gallery page and wanted to put a line or two of content on the page above the thumbnails. I saw no way to add this text, so I asked a support representative, who confirmed that unfortunately, it was not doable. Later in the process, when I had another question and was connected to a different representative, I expressed my dissatisfaction at not being able to add that paragraph. This representative had the idea to input my text in the page’s “slogan” field (under the settings tab) which would then be placed below the page title and above the gallery – and it worked! It is not that the first representative was incorrect, but rather the second representative thought outside of the box and provided a great workaround. So, it never hurts to ask the same question again! SITE123 has a 14-day refund policy. The first response I received to my cancellation and refund request was an email asking why I was cancelling and if there was anything they could do to help get my site going. They also wanted to know if there was anything they could do to improve their software or my experience. When I assured them I definitely wanted to cancel, they did so immediately and emailed me that I could expect my refund within 7 business days. The credit to my account actually appeared the following business day. The free plan is, well – free. The main limitations are that it includes only limited e-commerce functionality, the contact form content will not be directly mailed to you, you cannot have your own unique domain name, and the SITE123 branding box will be on every page. Although the free plan could work just fine for a personal site, these details definitely detract from a professional website and you will want to go for a paid, premium plan for your business website. While SITE123’s pricing page only displays two options (free or premium) there are actually 4 premium packages available with varying levels of options. These include removal of the floating SITE123 tag, ability to use your own domain name and email address and upgraded e-commerce features. While the level of services available increases with the plan’s pricing, the premium design options, such as allowing custom colors and submenu items, kick in at the very lowest premium plan. All premium plans come with a 14-day money back guarantee. Pro Tip – Check Out This Great Hack! Existing users get a 10% discount when they sign up for a premium plan – so don’t select a paid plan right away. Create an account with the free plan and then wait for an about an hour – you’ll get an email from Site123 with an offer for a 10% discount. SITE123 is an excellent choice for individuals and companies looking for a clean, well laid-out site that doesn’t require extreme design options, although it has some design and styling limitations. It also offers the advantage of in-house site maintenance without the learning curve of coding. If this suits your requirements, I highly recommend SITE123. As with any integrated website builder, if your site has a lot of content and special requirements, I recommend discussing them with SITE123 before embarking on a large project. There is nothing more frustrating than investing hours in creating a site only to find out it cannot function as envisioned. Most of the basic functionality can be tested using the free plan. You can then weigh the pros and cons of paying a design firm a onetime large fee to create your site as opposed to paying higher monthly fees to keep your site hosted at SITE123. Like SITE123 Review? Click here to build your website. Wondering how Site123 stacks up against other Website Builders? Enter any other Website Builder and we will give you a side-by-side comparison.